UPDATE: Enjoy this cozy project in the family room of our former home. We’ve moved and are giving our new-to-us home a complete remodel. I’ve completely changed my style! Click HERE to take a look. When the temps drop low and there’s nowhere to go, I want nothing more than to cozy up at home in my pj’s. I don’t even want to put my big toe out the door if I don’t have to. It doesn’t take much to make me snug as a bug in a rug. All I need are some soft, squishy pillows a fuzzy cuddly throw and my warm little lap puppy. And of course, a good cup of my fave hot chocolate is appreciated too! I spend quite a bit of time in this little corner of my world. This is where I blog, where I have my quiet time and where I watch tv. So I put together a wintery vignette to give me something pleasing to enjoy while I’m snuggled up here. I broke down and purchased this white fluted bowl from Pier I. 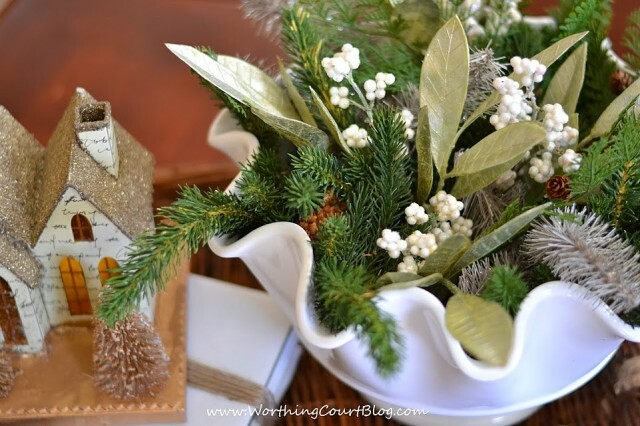 It makes a great container to fill with faux greenery and wintery leaves and berries. 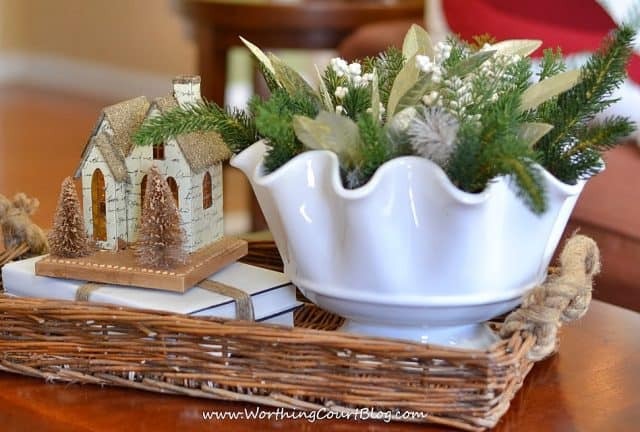 In my book, greenery isn’t just for the holidays. It’s perfect to use as part of my winter decor. And the soft green leaves and white berries support the winter theme. Here’s a peek from the top so that you can see how I just poked and layered all of the stems together. 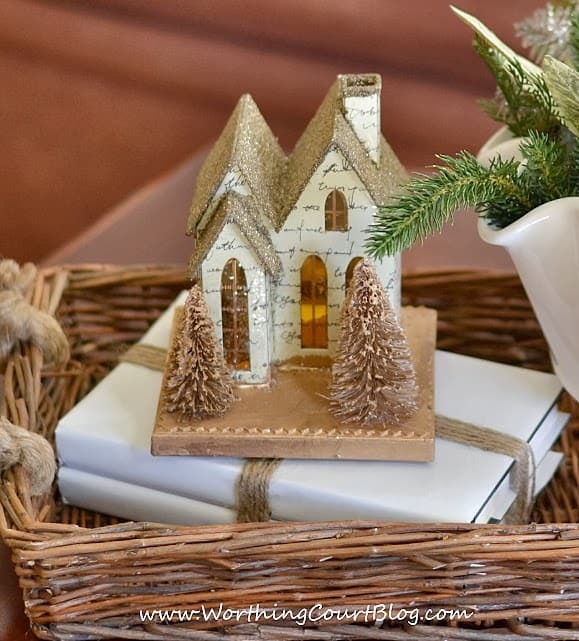 A cute paper church has a place of prominence in the vignette when placed atop a stack of books. My books were different colors, so I wrapped them with white paper and tied the bundle with some jute twine. Too bad you can’t see that as I’m writing to you, I’m sitting in this very spot – all snuggled up with my throws and pillows, my computer in my lap and my warm lap puppy snuggled up just as close to me as she can possibly get. For keeping yourself and your kiddos cozy, check out my No-Sew Cozy Projects. All three items were super easy to make and the total cost was only $5.50! oh suzy, I can see you know all cuddled up! Love that bowl. did you get it recently? Hi Laura. I sure did! I picked it up about two weeks ago at Pier 1. Your home is always so warm and cozy at any time of year!!! You’ve created the perfect comfy, cozy, warm spot to curl up on a cold day!! Love all your attention to detail to make it such a pleasant inviting place to spend those quiet moments. Absolutely LOVING that fluted white bowl, what a versatile piece for all seasons and so sweet full of greenery. And that lamp… and that blanket… okay, I’m loving everything! Cozy indeed!! Your little spot looks so pretty Suzy! Cozy indeed and very inviting. Loved seeing the pic of your little pooch and happy to be touring with you! Suzy I just love your cozy little corner and that pillow is darling! So thrilled to be part of the tour with you today! Suzy, this is my idea of a very cozy what to while away winter! I love that you use greens during the winter months. I really need a bit of green in my rooms! LOVE the cardinal pillow! Oh Suzy, I can just picture you now in your cozy spot. How lovely!! I’m in love with the cardinal pillow AND that precious glittery paper church. The mixture of plaids is also quite lovely. I need a lap dog!!! Blessings to you! Cozy for sure! 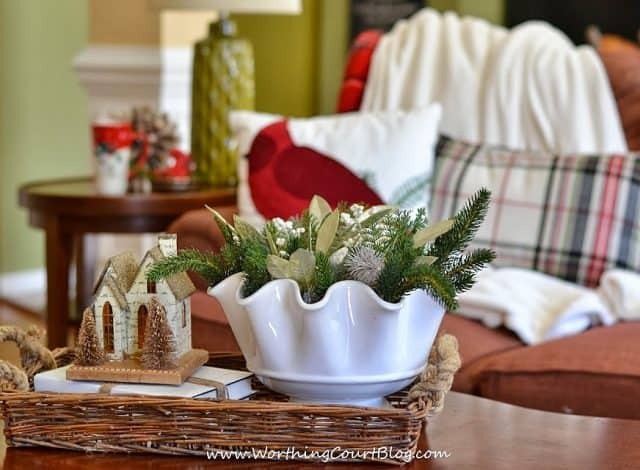 I still love that Verbena green and how well it mixes with seasonal decor. 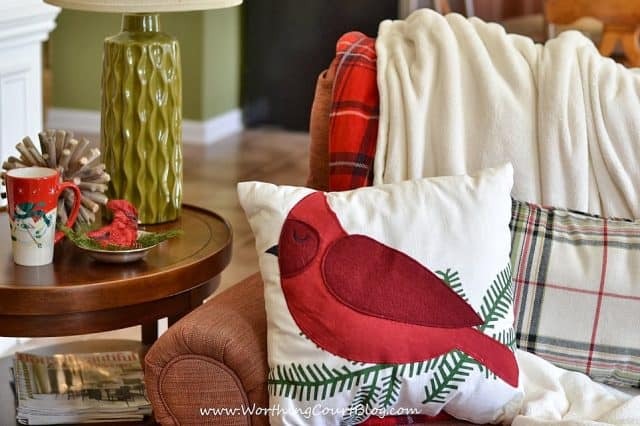 Loving the cardinal pillow and the mix of plaids. 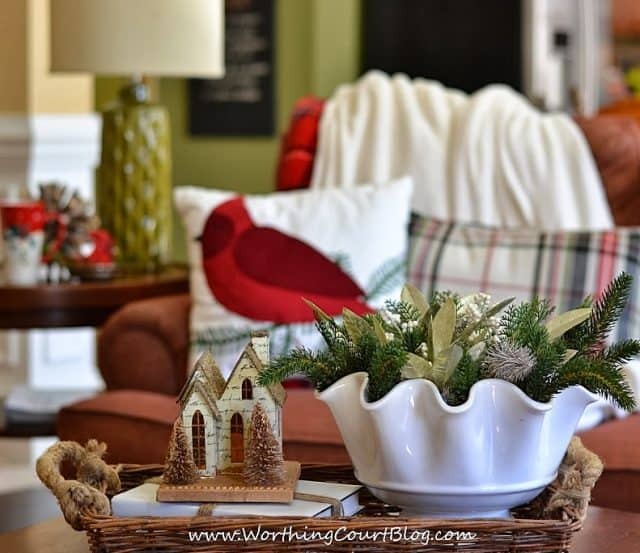 Suzy your home is so beautiful,cozy and inviting!Love your pretty vignette,and that sweet cardinal pillow too! I am thrilled to be part of the tour along with all of you amazing ladies! Your lounging spot looks so pretty and cozy. I wish I could join you there for a chat and a cup of hot chocolate. I’d insist on cuddling your fur baby while we visit! Cute puppy!! Love that bird pillow!! Suzy – I love that Cardinal pillow! Your little cozy spot is just perfect for these cold winter days! I love the pop of red in your cozy spot! I am always so sad when I take down the Christmas decor, keeping some red in with the plaids and cardinals is a great way to keep it cheerful. Pinning! I agree that greenery is not only for Christmas!! I’m fortunate enough to be surrounded by it, and take advantage of that in my decorating!! I love your beautiful home & it has got me excited to make my own little “corner” to get cozy!! Thank you! I love how you mixed the red and white with the cheery cardinal theme. Your spot looks cozy and comfortable, for sure! Not only do we share the same name but we share the love of red in our decorating. Your room looks so inviting and I want to just cuddle up in those throws on the sofa! Thanks for letting me “visit” your home. What a great place to be warm a snuggly and the pups sure help with that don’t they??? Love the Cardinal pillow too. I love your bright red home accents–so warm and bright for this dreary January weather. Your dog looks like the perfect ‘cozy’ friend too! Happy to be on the Cozy Home Tour with you! Your spot looks so cozy! I love using greenery to warm up a space too. So glad I got to share this tour with you!! Super cozy Suzy. Wish I was there having a cup of tea with you. 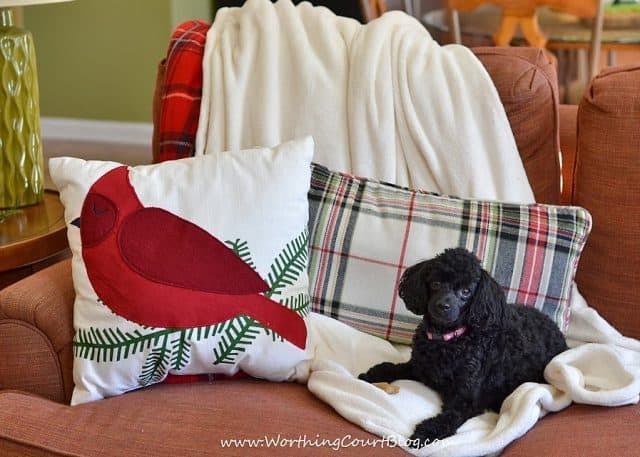 LOVE your cozy space with the cute cardinal pillow and snugly little lap puppy. I don’t blame you for getting the white scalloped bowl. LOVE white bowls. I like the greenery you chose for it , too. Have a great Sunday and stay warm.